Falling furniture injures more than 2,500 kids annually and now one Lakeland mother, whose son died after being crushed by a dresser, is joining a watchdog group in demanding a recall of dangerous dressers. 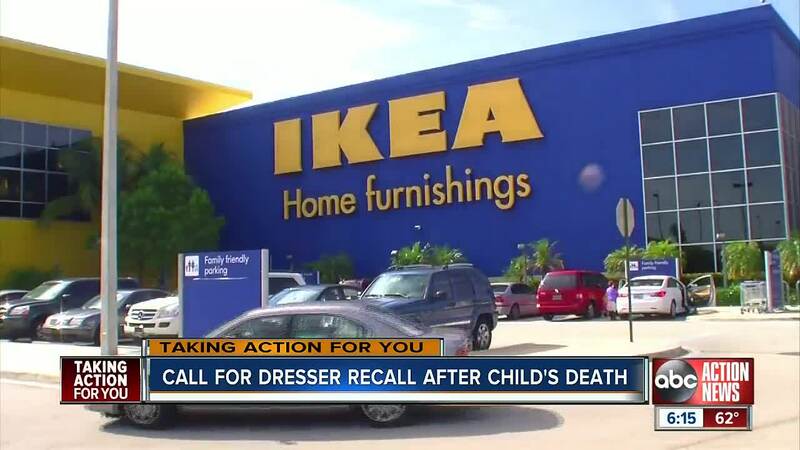 LAKELAND, Fla. — Falling furniture injures more than 2,500 kids annually and now one Lakeland mother, whose son died after being crushed by a dresser, is joining a watchdog group in demanding a recall of dangerous dressers. Ikea continues to sell the Hemnes dresser, the same model that fell on Meghan Delong’s 2-year-old son, Conner, on Mother’s Day 2017. “I walked into his bedroom shortly after he woke up and found him trapped underneath his dresser,” Delong told Consumer Reporter Jackie Callaway. Conner is one of 200 children who’ve been killed by falling furniture nationwide since 2000. Furniture and television tip-overs send one child to the hospital every 24 minutes in the U.S. and every two weeks a child dies in one of these accidents, according to the Consumer Product Safety Commission. Meghan Delong told ABC Action News she believes dressers that kill children should be removed from stores and recalled nationwide. William Wallace of Consumer Reports called the Hemnes dresser “dangerous” and wants it recalled. ABC Action News reached out to Ikea. In a statement, a spokesperson defended the dresser as safe when attached to the wall with the free anchor kits the company provides. “When assembled and used according to the instructions provided, all IKEA chests of drawers are safe to use. For decades, IKEA dressers have been sold with instructions to attach dressers to the wall,” the spokesperson said. There are no government rules that specifically target prevention of furniture tip-overs. The furniture industry sets its own safety standards and tests dressers by placing 50-pound weights in the drawers. But experts say that test does not simulate a child climbing the front of a dresser. Safety experts say all furniture in a child’s room needs to be anchored to the wall with straps. Delong now uses straps to secure the furniture in her other son’s bedroom.